Sabudana namkeen is the most common vrat ki namkeen in Indian fasting snacks. 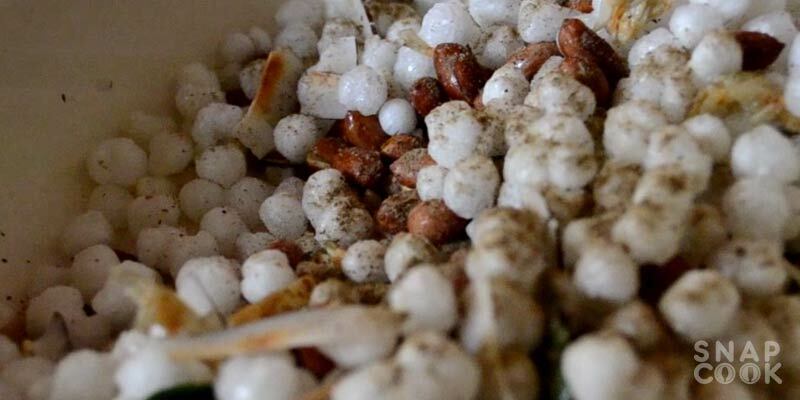 This vrat ki namkeen is easily available in market during navratri vrat or any other Indian vrat season. 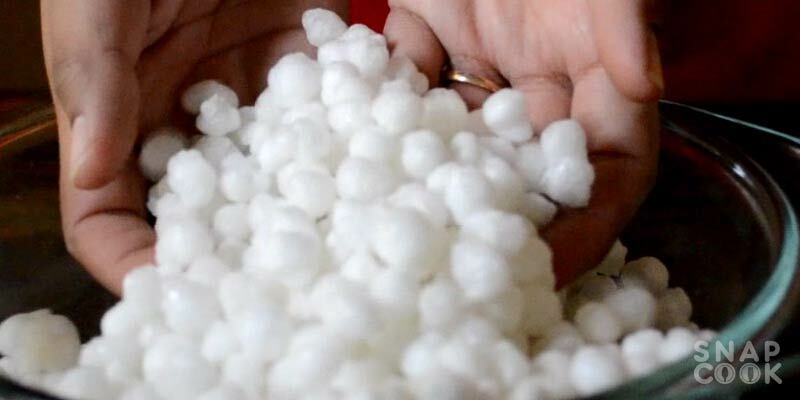 But the sabudana / sago vrat ki namkeen available in market is full of oil and you never know what else ingredients. So with this easy recipe, you can make this sabudana vrat ki namkeen at home every easy and with least oil. For this vrat ki namkeen we will be using microwave to roast our ingredients. This will help us make our sabudana namkeen recipe with minimum oil. The only time we are using oil is when we mix or bind these ingredients together. Even then we will use only 1-1.5 Tbsp oil. Granulated sugar / Boora – 1Tsp. 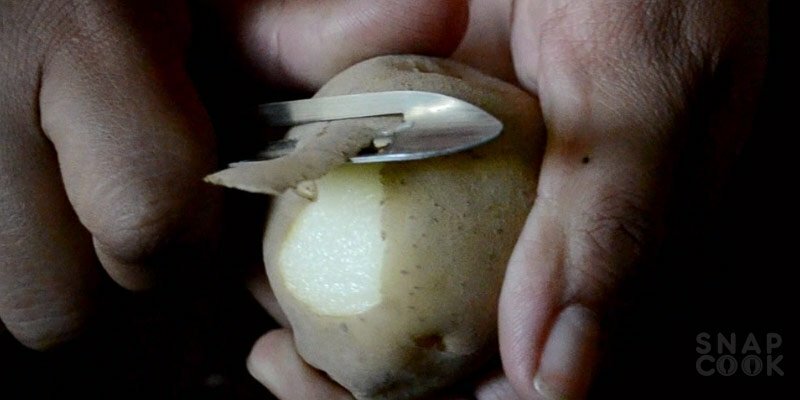 1 – Peel the potatoes. 2 – Wash them under cold water. 3- Take a potato chips maker to make thin slices or just use a sharp knife to make thin chips like slices. 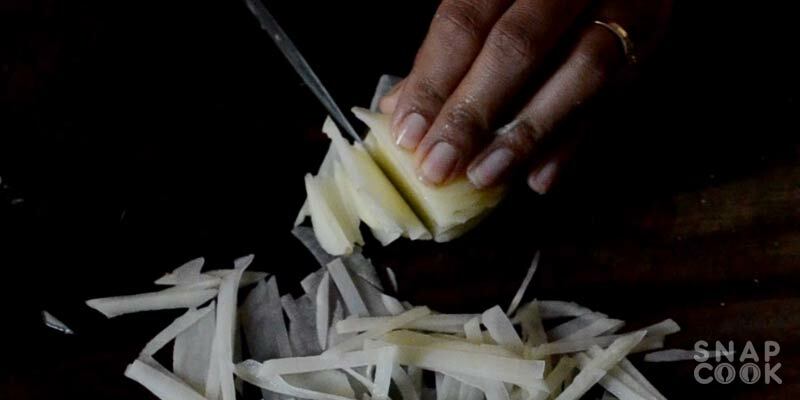 4- Cut the potato slices in small strips to make aloo lachcha. 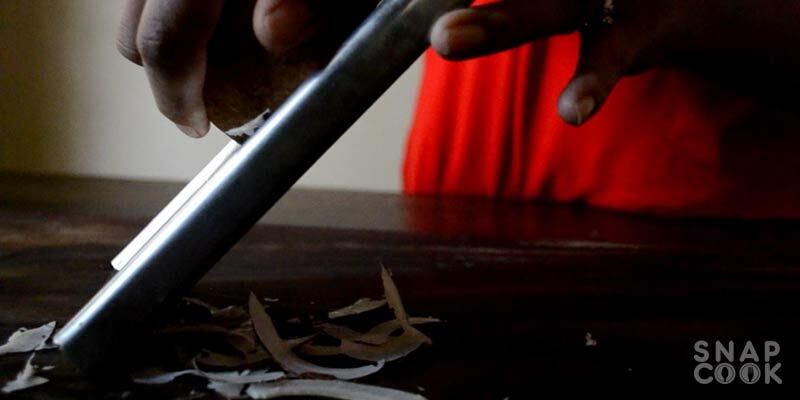 5 – Keep the potato slices on a clean dry cloth and let dry under the Sun or fan for 15-20 mins. 6- Take 1 cup sabudana in a microwave plate and put it in microwave for 3-4 mins at high power (900watts). For better roasting, keep them in two batches of 3-4 mins each. 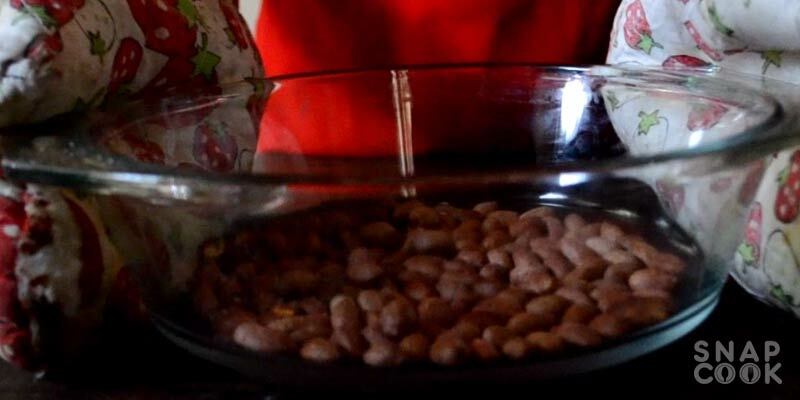 7- Take 1 cup peanuts and put it on a microwave plate and microwave them for 3 min at high power(900 watts). For better roasting keep stirring the peanuts after every 1 min in microwave. 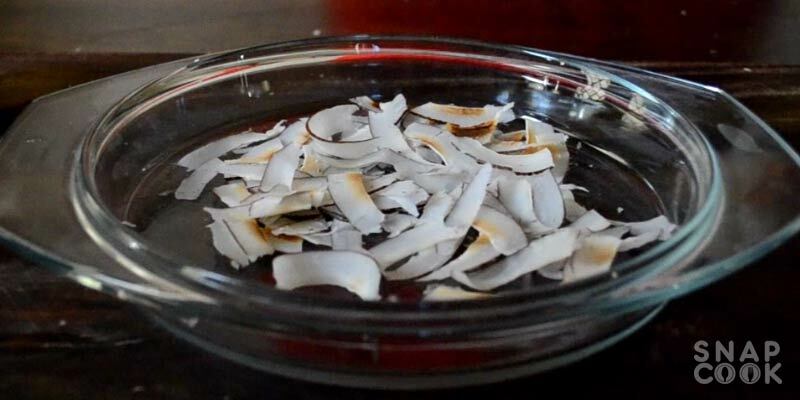 9 – Put the dry coconut slices in microwave tray and put it in microwave for 1 min at high power (900 watts). 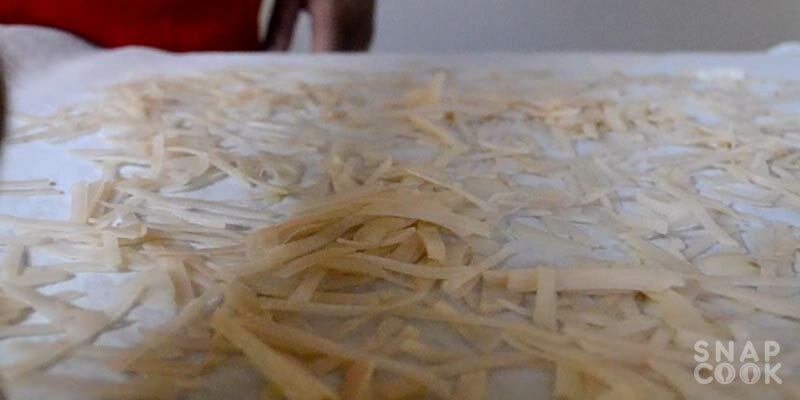 10- Take some potato strips that we dried in Sun / Fan. Put some of them on a microwave plate and microwave it for 3-4 mins. 11- In a pan take 1.5 Tbsp oil and add 1 small chopped green chilly, 3-4 curry leaves, 1 Tsp Sendha namak and 1 Tsp granulated sugar or boora. Stir the mix for 1 min. 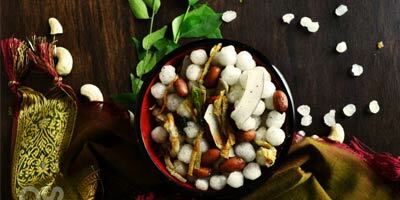 12 – Add the roasted sabudana, peanuts, coconut and potato strips and mix them well with 1 Tsp Black pepper powder. Our Diet Sabudana Vrat ki Namkeen is now ready. Serve it with tea / coffee or take it with your at your work and enjoy your Vrat day with super nutritive and diet sabudana vrat ki namkeen. Sabudana / Sago -1 Cup. Potatos – 2 medium size. Dry coconut – 1/2 small size. Green Chillies (chopped)- 1 small size. Sendha Namak – 1 Tsp. Black Pepper Powder – 1/2 Tsp. Wash them under cold water. Take a potato chips maker to make thin slices or just use a sharp knife to make thin chips like slices. 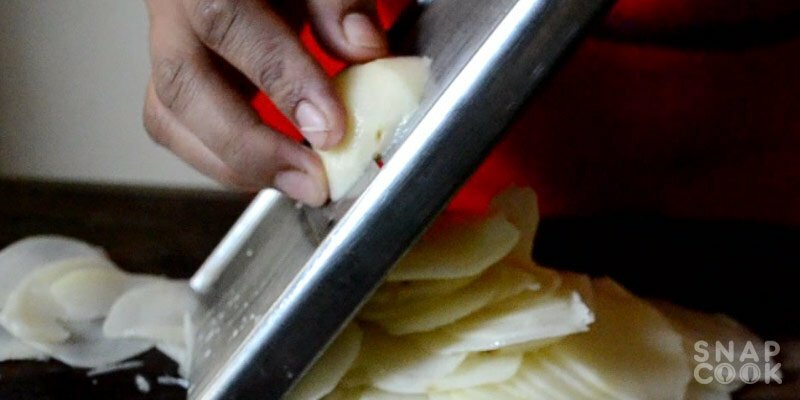 Cut the potato slices in small strips to make aloo lachcha. Keep the potato slices on a clean dry cloth and let dry under the Sun or fan for 15-20 mins. 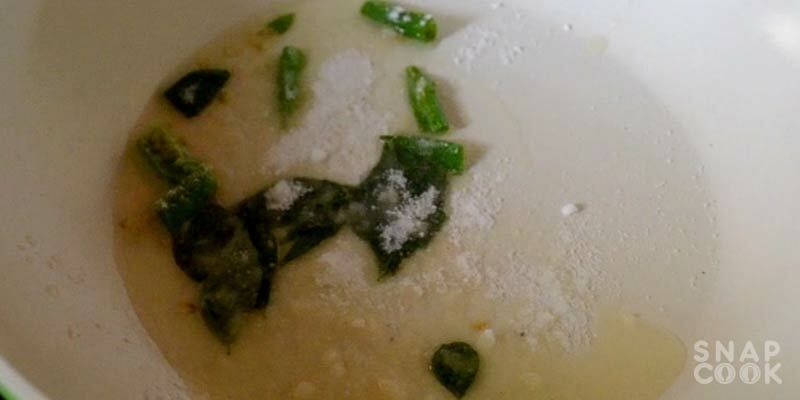 Take 1 cup sabudana in a microwave plate and put it in microwave for 3-4 mins at high power (900watts). For better roasting, keep them in two batches of 3-4 mins each. Take 1 cup peanuts and put it on a microwave plate and microwave them for 3 min at high power(900 watts). For better roasting keep stirring the peanuts after every 1 min in microwave. 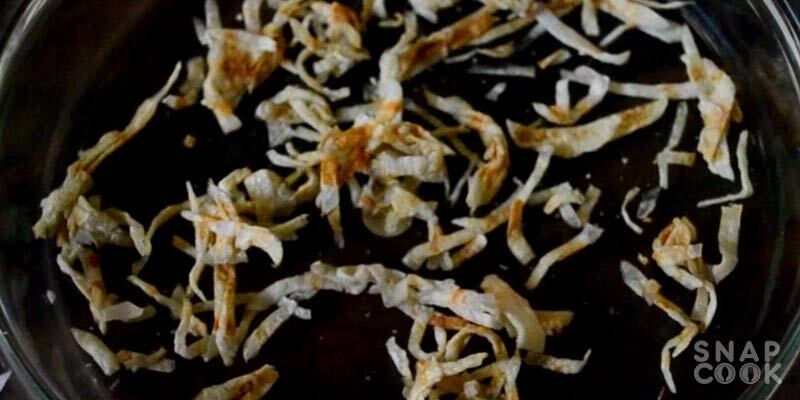 Put the dry coconut slices in microwave tray and put it in microwave for 1 min at high power (900 watts). Take some potato strips that we dried in Sun / Fan. Put some of them on a microwave plate and microwave it for 3-4 mins. In a pan take 1.5 Tbsp oil and add 1 small chopped green chilly, 3-4 curry leaves, 1 Tsp Sendha namak and 1 Tsp granulated sugar or boora. Stir the mix for 1 min. 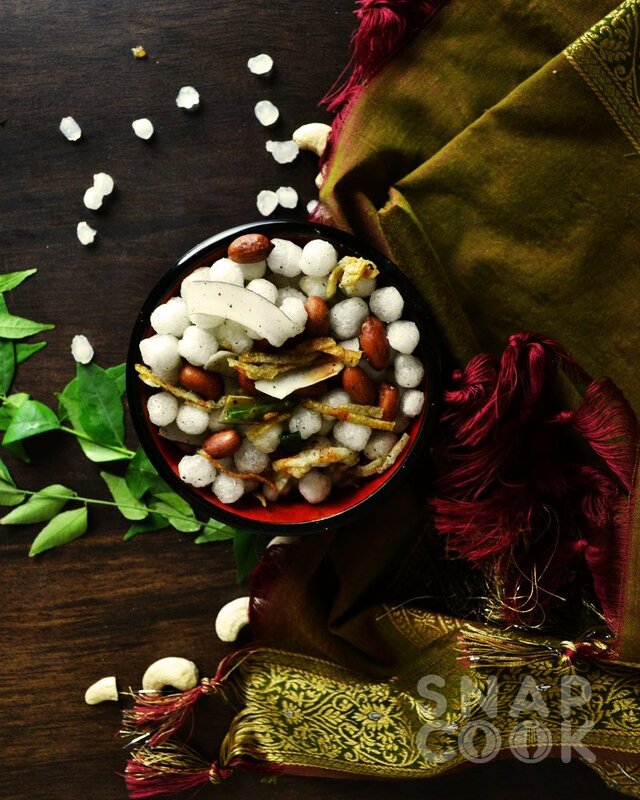 Add the roasted sabudana, peanuts, coconut and potato strips and mix them well with 1 Tsp Black pepper powder. Our Diet Sabudana Vrat ki Namkeen is now ready.